Footwork is one of the most important aspects of many sports especially in boxing. 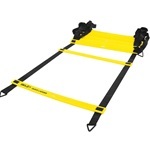 Good footwork does not come naturally to most people but one piece of equipment that can be used to improve your footwork is an agility ladder. 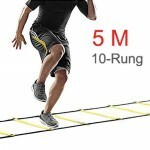 Agility ladders also known as speed ladders is probably most associated as an equipment used for footballers, but it is also very beneficial for many other sports as well. The same goes for skipping is probably most associated with boxing but it’ll also be very beneficial for footballers to improve their footwork and coordination. Agility – This is the ability to change directions of the body in an efficient and effective way. 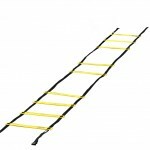 As the name suggests, working out using an agility ladder will enable you to improve your agility. The elements of having good agility requires: Balance, speed, strength and coordination, so you can bet those four elements will also be improved. 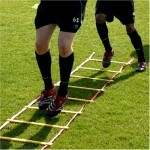 Footwork – To become fluent in using an agility ladder this requires complex footwork. Like with anything leading up to this level of competency will involve a lot of trial and error but on the flip side this will lead to improvement and improve your overall footwork. Speed – Many speed ladder workouts will involve quick foot movement, if you’re a beginner then you’ll probably start off slower then gradually build up speed. If you get to a quick pace then inevitably your coordination is going to improve along with your speed, as the workouts will require a good level of coordination also. Cardio – With the combination of the difficult footwork, coordination, speed, balance and strength required this will make you work your body. If you feel you’re starting to get comfortable then you can increase the intensity so you’re still getting a good workout from it. Portable – The best agility ladders shown in our table above all come with a carry bag and the ladders can fold up so it doesn’t take up much room. 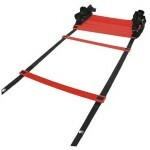 To deploy the agility ladder it obviously will require a lot more room unlike working out with a skipping rope. Cheap and easy to get started – This is a cheap but useful piece of equipment, it also lasts a very long time so probably wouldn’t need to be replaced. If you do plan on using it at home then the only thing is you’ll need a bit of room but using it outdoors you’re bound to find space easily. Agility Ladder Or Skipping Rope? As you can see the benefits you’ll gain from an agility ladder is similar to the benefits you’ll gain from skipping rope training. There are some benefits that you’ll gain from using one but not as much with the other. For example an agility ladder will improve your agility much more than a skipping rope would, but a skipping rope will build your shoulder and forearm muscles much more than an agility ladder would. To reap the maximum benefits I recommend you implement both as part of your training regime. Below is a video which shows 30 different drills the ladder can be used for. © 2019 Boxing Training Gear. All Rights Reserved. Created using PressWork.